Shopping for Spider-Man Pin Mates? Wooden New York City diorama - complete with Goblin Glider! Spider-Man and Green Goblin, mano a mano! Includes 2 retro-styled, 2-inch scale wooden figures. Each figure is individually numbered within the Marvel Pin Mate™ series. 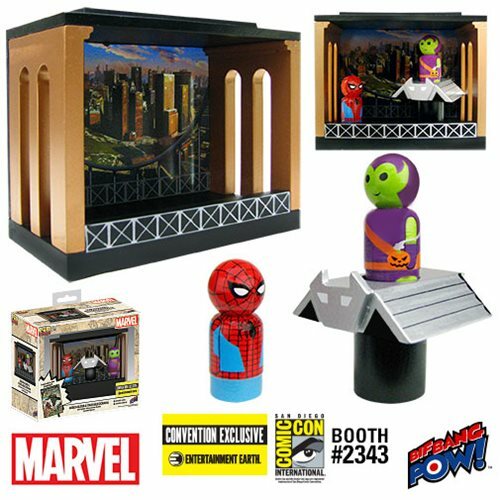 Spidey and Green Goblin face off in this sensational Spider-Man Pin Mate Wood Glider Set with Spider-Man and Green Goblin from Bif Bang Pow!. The epic battle takes place inside a wooden New York City diorama - complete with the Goblin Glider - and both retro-styled, 2-inch scale wooden figures are individually numbered within the Marvel Pin Mate™ series! Featuring highly detailed, brightly colored, 360-degree artwork, Spider-Man is number 11 and Green Goblin is number 13 in the series. Who are you betting on to win? Ages 14 and up.